A few weeks ago, I was interviewed for a podcast and, at the end of the show, invited anyone who had any questions to send me an email or an Instagram message. I was completely overwhelmed by the response I received: dozens of emails and messages have been flooding in ever since with requests for more information about blogging and how I grew my site through focused, strategic work. Since you had so many great questions, and so many of you had similar questions, this mini-series of posts will elaborate on all of the things you wanted to know! When I went on the Food Blogger Pro podcast a couple of weeks ago, I had no idea what to expect. Was I the only one who felt like I was just getting my sh*t together after 5 years (!) of this blogging thing? Did I sound like one of those obnoxious people who acts like they discovered information everyone has known all along? Did I have anything (anything??) original or useful to share? It turns out that so many of you are in the same boat that I was in a year ago. When you think about it, it makes sense: blogging is a passion project. But the reality of blogging is that it is hard work, requires you to wear many hats and develop unexpected skills, and – this is the really hard part – the path to success is uncertain and probably a little different for everyone. This series is for you. If you haven’t had a chance to listen to the podcast yet, you may not know much about how I got here. Let me fill you in. In early 2017, I had just had a baby, and left my extremely demanding job. I’d been running A Clean Bake as a hobby for 3 years, and assumed it would be easy to turn it into a steady income stream. My plan was: quit my job, grow my blog effortlessly and just by showing up, rule the internet. Ok maybe not that last one. But I looked around at the blogging community and saw so many other stay-at-home moms who had launched and were running successful blogs. In my mind, my barrier to growth had always been my full time job; now that that was out of the picture, I was free to grow my business with abandon. The sky was the limit! My first mistake was blaming external factors for my lack of growth, and expecting to succeed by just showing up. My next mistake was not having a plan. When I pivoted from “hobby” to “business”, all I did was change my language. My growth plan was to try to mimic what other full time bloggers were doing. Without a strategy for my business, I had no understanding of what I was trying to do with my site, how it was unique, or what value it provided. I just looked around at other bloggers who, I knew, ran their sites as their full time job, and tried to mimic what they did (not knowing, at the time, that many of these bloggers have an army of assistants and contractors to whom they outsource a lot of tasks). I went all in, on everything, all at once. And I didn’t have the first clue what to prioritize. As I said on the podcast, I had no priorities, so everything was a priority. So, of course, I got nowhere. After all, how can you make progress if you don’t even know what path you’re on? After many months of being frustrated, overworked, and exhausted by the job of blogging, I forced myself to stop and think about the ways I was spending my time, and what the root causes were of my lack of progress. The length and diversity of this list is the first red flag. If your to-do list looks like this for the week or the month, and you don’t have any help with any of it, take note. This is too much for one person. You can’t do everything, let alone do it well. One more time: this is an impossible list. If your responsibilities look like this, too, you’re stretched too thin. I’d guess that this is the #1 reason why you’re not seeing any progress. Not only did I obviously have to strike a lot of those items off my list, but I also had to think even bigger, not just about whether each of those tasks was worth my time – but whether blogging was what I wanted to be doing at all. Do I want to keep trying? Do I think anything will change? Is this the right career path for me? Is now the right time for it? Do I even want to continue blogging at all? My first important realization was that I wasn’t doing all of these tasks because they were right for my business, I was doing them because I thought that I had to do all of them to make money as a blogger. This led me to a major realization: the income pressure of full time blogging was the biggest factor in my failure to thrive as a full time blogger. 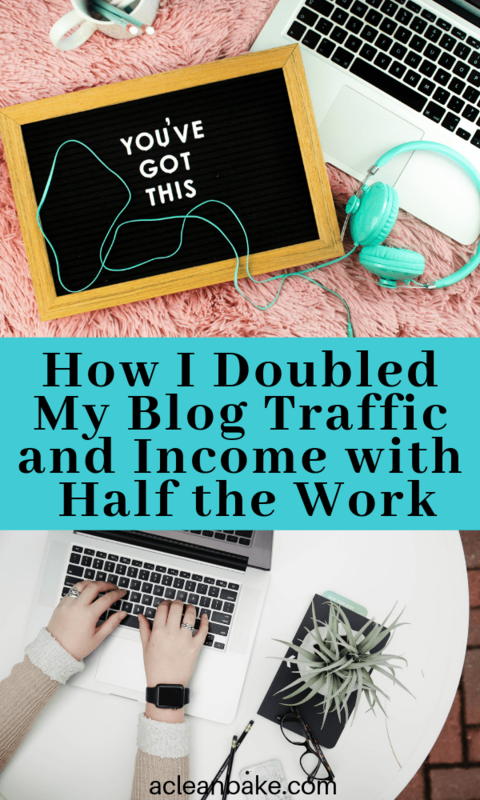 I was so accustomed to regular, predictable income from my previous job that I had become consumed by financial panic as a self-employed blogger and freelancer. Worrying about when and from where I would receive my next paycheck was distracting me from a the kind of bigger-picture perspective of my business that is necessary for success. So I looked for a job with a regular paycheck, which relieved the financial pressure and allowed me a lot more freedom to make the right moves for my business, rather than chasing my next dollar. Going from full time to part time could have killed my blog. But it saved it. I started my new job at the beginning of 2018, running SEO-focused editorial strategy for a content marketing firm. That my day job and my blog work are so synergistic was not, by the way, a coincidence. I knew I wanted to keep blogging, so I looked for a full time job that would complement it. My boss is also a dedicated blogger, and we all encourage each other’s side projects. But, because I had a one year old, and was getting up to speed on a full time job, I didn’t do much blogging at the beginning of 2018. I took that time to gain some distance from the site, which allowed me the objectivity to figure out what to do next. Ultimately, the question was whether I wanted to continue blogging (for the right reasons)? The answer was yes, but with such limited time, I had to commit to a strategic direction that would ensure that every minute I devoted to my business would pay off. What was my key goal(s)? In other words, what was I trying to accomplish by continuing to blog? Who was I doing it for? What was I providing them (i.e. what problem was I solving for them), and what was different about my offering that they couldn’t get anywhere else? From the answers to these two questions, I was able to paint a picture for myself of exactly what my brand represented, and exactly how it served its target customer effectively. The very succinct version is this: A Clean Bake is a recipe website that helps people with ingredient-restricted diets eat safe versions of “normal” foods. 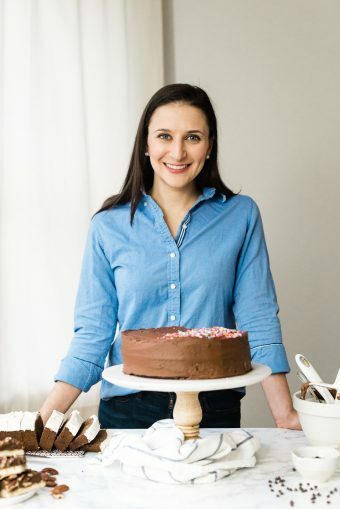 Primarily, the emphasis is on making gluten free, (mostly) grain free, and (mostly) dairy free, and naturally sweetened desserts accessible and enjoyable for as many people as possible which meant, in practical terms, that my key metric would be traffic. Tl; dr, my primary goal for 2018 was to increase my traffic. Something that was essential to my brand and business goals, so I needed to keep doing it myself. For me, that was recipe development, photography, writing, SEO, and Instagram. Something that was helpful for achieving my goals, but was not a fundamental part of my brand, so I didn’t need to handle it. For me, that was technical maintenance, Pinterest management, Facebook and Twitter posting, many administrative tasks, and designing Pinterest pins. I outsourced all of these either to freelancers or to automation software. Something that did not contribute to my business goals, and I didn’t enjoy. I just stopped doing these tasks, which included video production, freelancing, and most sponsored work (and I raised my rates on the sponsored work I did take, since my time was so limited and I needed it to be worth my while to do it). I’m going to go into more detail about exactly how I build my blog’s business strategy in another post, so if you have any specific questions about it that you’d like me to answer, leave me a comment on this post. I grew my site by working smarter, not harder. Everyone wants a silver bullet, so here it is: I figured out my number one goal for my business, and only did work that would support that goal. For me it was increasing my blog’s growth: more traffic, primarily through search traffic, which would result in more earning power. From that moment on, my decisions were easy. I identified the types of work that brought traffic to my site, and only did those. I focused on SEO and put my energy into producing less, better content. I spent a ton of time on keyword research and content planning (and still do). Learning about SEO is the secret to writing successful new content and optimizing old content. After all, if I’m going to spend time creating a blog post, I need to make sure it is going to deliver good ROI (return on investment). In other words, I needed to be intentional about setting up each post to have the best chance of driving traffic. I hate to break it to you, but the “if you build it, they will come” model no longer works in blogging — if it ever did. Instead of guessing what people might be searching for and writing what I thought sounded good, I started targeting my posts to specific queries, working very conscientiously to establish a particular authority in the eyes of Google, and targeting related keywords and phrases to ensure I was writing the most valuable content I could. I stopped posting just to post. I applied SEO best practices to new posts, but also focused a great deal of time on optimizing old posts which were ranking well but, with a little targeted updating, could be ranking on the first page and driving exponentially more traffic faster than a new post would. For context, it takes a new post anywhere from 3-6 months to reach its ranking, whereas an optimized post can rank higher in just a matter of weeks, depending on the site. Spending twice as much time optimizing old posts as I did writing new posts was the trick to increasing my search traffic quickly. Discussing SEO is an article (or really an entire course) in and of itself, but learning to use keyword research and rank tracking tools like SEM Rush and Ahrefs was an absolute game changer. I stopped wasting time on social media channels that weren’t working for me. After spending some time experimenting with Facebook and Twitter, I concluded that neither channel was driving any meaningful traffic or engagement from my audience. So I gave up. I pay a monthly fee of around $20 for an automation tool that posts for me, and I rarely have to touch it. I’ve seen no negative impact to my business from giving up on those channels. I still manage Instagram because I enjoy it, but it also doesn’t drive much meaningful traffic. I keep that in mind when I’m trying to force myself to post and just, well, don’t. Unlike Facebook, Twitter, and even Instagram, Pinterest is a social media channel that actually drives decent traffic to your site. It’s nothing like it used to be, but it is a sizable chunk of my site visitors every month. I was determined to be intentional with my resources in 2018 and really focus on bootstrapping until I figured out exactly what was worth investing in. Pinterest management was the exception. I knew that Pinterest was actually a valuable investment but one that I had neither the time nor the interest in figuring out. For a monthly fee (not cheap, but it ended up paying for itself), I was able to turn over my Pinterest management to an expert. The value of being able to see that traffic coming to my site without having to figure it out or manage it myself is absolutely priceless. I stopped freelancing, minimized sponsored work, and started pricing myself fairly. Freelancing drove no additional traffic to my website, and sponsored posts weren’t doing very well for me, either. The entire process of freelancing and doing sponsored posts (from pitching all the way through to invoicing) took up so much of my time and energy in 2017, but between ingredients, equipment, and childcare, I barely broke even on the work. I don’t even think I earned anything for the cost of my time. So I quit freelancing and raised my sponsored content rates to a point where it was a fair reflection of the time, energy, skill, and talent that goes into a given post. I get questions a lot about pricing your work. While there are lots of tools out there to give you a ballpark idea of what you could be charging, there is ultimately no secret to pricing. It’s all about what economists call “what the market will bear” – which is a fancy way of saying that you should charge what someone will pay for your good or service. I played around with rates until I found a level that was worth my time and that the brands I wanted to work with were willing to pay. It took some time, and some trial and error, but it worked. I also completely stopped accepting product in exchange for work. In other words, many brands expect to send people free products in exchange for a full post about them. In other words: they want to exploit bloggers into giving them free work. By raising my prices, being very picky about the work I accepted, and saying no to any work done on spec or in exchange for product, I earned more in 2018 from 1 sponsored blog post and 2 sponsored Instagram posts than I did in 2017 when I did 5 full sponsored blog posts. Remember: (reasonably) higher prices are a great way to filter out brands that don’t value your work. More money for a fraction of the work? Yes, please. I stopped trying to make recipe videos. This may not be the case for your business, but in 2018, videos were not doing anything for me. I didn’t know how to use them properly, and as a result, saw NO meaningful increase in engagement, social following, or site traffic as a result of doing a few videos. Plus, it was distracting and frustrating for me to try to make them myself. But since, as I said, I didn’t have a strong enough idea of how to use it to my site’s benefit, I couldn’t justify paying to outsource the work. Yes, video is supposed to be the secret to success, especially on social media. But, since I had decided that I wasn’t going to invest heavily in social media, and I genuinely despised doing video, there was no reason to pursue it. I’ll try again in the future, once I work out exactly how to use video to support my business goals. I ignored non-essential technical issues. There are certain technical improvements to your site that will genuinely, significantly improve your site’s search rankings, user experience, and – as a result – traffic. Then there are those which are, if not a waste of time, not worth spending time on over more important other tasks. Google has developed this very panic-inducing style of letting you know when something on your site isn’t exactly as they want it to be, so it is easy to spend hours updating non-essential components of your site – which may or may provide any ranking or user experience benefit. Worrying about every single alert Google displays in Search Console, assuming that without a video, author, and keyword in every single recipe card, your site will never do well in search. For the record, I am not encouraging you to ignore the advice in Search Console. Far from it! Google invented the game, so we need to play by their rules. But, when working with limited time and resources, the best thing I did was to triage all the demands on my time, and this was a big one. Because I had a decent idea of what site characteristics mattered most for SEO, I was able to determine which technical improvements would actually pay off, which were less urgent, and what could be ignored (for now). For example, you’ll see a warning on your Search Console if you don’t have a video in every single recipe card. Yet the consensus in the SEO community is that video is not (yet) a ranking factor. Imagine how many hours you would waste if you put aside all of your other work to create videos for all of the recipes on your site? The best strategy for your site design is to pick a good quality theme and run the fewest possible plugins you can get away with. Hard code as much customization as you can (or hire someone to do it), versus running dozens and dozens of plugins. Do some research, make a plan, and hire help if necessary. Optimized images and recipe card for load time (Remember, site speed is a major ranking factor). There are tons of little technical things that could be improved on my site, but addressing about them was wasting so much of the time I could be spending creating content. I put them in a spreadsheet for a future VA. Again, remember that not doing something right now doesn’t mean you’re never going to tackle it! I automated everything I could. This was less about directly increasing my traffic, and more about freeing up every minute I could for work that did contribute to my site performance. Think about any repetitive task that you do for your blog. For me, it was updating Facebook and Twitter, pinning new posts to Pinterest, adding the same disclaimers to the end of every post, adding ingredient source links to recipe cards, and tracking income and expenses. SmarterQueue (affiliate link) and Zapier to manage Facebook and Twitter, and built other workflows and automation (SmarterQueue has a free subscription, but I pay $20/month. Zapier is free, although there are paid plans if you want more capabilities). Asana to manage my to-do list and other administrative tasks (Free). Wave to manage my P&L (profit and loss statement, aka my accounting), create and send invoices and payment reminders, and prepare tax reporting documents at the end of the year (Free, though I pay a nominal fee each time I get paid through a Wave invoice). Tailwind to auto-pin to Pinterest for me ($10-20/month). As I mentioned earlier, I have since hired an expert to handle my Pinterest management, including Tailwind, for me. Canva to create Pinterest pins. Although pin creation is a manual process, I set up a template on Canva which allows me to simply drop in a new photo and change the text for each new pin, saving me tons of time over creating an original design for each post (free). Although each of these programs might save me 5 minutes a day, enough of those 5 minute tasks taken off your plate really add up. Plus, not having to remember to stop and do so many little administrative tasks every day or week frees up so much more mental energy for focused, productive creativity. I said no to not one, but two book deals. But, I thought that being approached by a publisher would be a dream come true. When it happened twice in a year, I realized that it just wasn’t the right time for me. This is ultimately a whole other story, but here’s the short version: both publishers were pushing me to write concepts that didn’t feel like the right fit for my expertise, and much of cookbook writing (at least at my level) is marketing your book, which in turn means aggressively growing your social media channels. I knew the whole process would be stressful and distracting, and all for a book(s) that I didn’t really want to do in the first place. Letting go of opportunities that weren’t right for me – in this case cookbooks, but also partnerships, freelance work, and similar opportunities along the way – left me the time and energy to to create the content I want to create (including developing a cookbook concept I’ve had for years and am VERY excited to write) and that both my audience and Google wanted to see. I reduced my email newsletter to one monthly roundup. I can’t even tell you how much time I was spending agonizing over “having” to write a weekly newsletter. The irony is that because I was spending my limited time each week on things like forcing myself to write a newsletter, I ended up with far less content to put in that newsletter. First, I experimented with RSS, which automatically sends new posts to your audience, but found that a curated newsletter, as opposed to automated post emails, got a far better response from my email list. So I gradually reduced the posting frequency until I hit a point where I had enough to say, it was no longer feeling like a chore for me to do, and the time commitment felt manageable. Monthly newsletters allow enough content to accrue so that I have plenty of value to offer the reader in each email. They’re happy with a content-rich newsletter that’s worth opening. I’m happy because I saved hours by not writing multiple monthly emails that no one was going to read. I focused on ad income (and optimized my site for it). Last, but certainly not least, let’s talk about the money, since that’s probably why a lot of you are here. My goal was traffic, obviously, cutting down on a lot of income generating work in order to focus on activities that increased my traffic is certainly not a very smart business strategy! Traffic won’t pay the bills, after all. Luckily, I was running advertisements on this site, which essentially offer a way to convert traffic to income. In 2018, I challenged myself to meet or exceed my total 2017 income (which was from ads, sponsored work, and freelance work) with ads alone (and I ended up doing 1 sponsored blog posts and 2 sponsored Instagram posts, too). The best part about advertising income, and the reason I wanted to focus on monetizing my site, is that it is passive income. Most other income sources – like sponsored posts and creating content for other people and brands – are active. You have to do something in order to make money. As long as people are coming to your site, ads earn money, even if you don’t post for a week. The most obvious way to increase your ad income is to increase your traffic, but that’s not the only way. And that’s definitely the longer play – which was not what I was going for. Traffic is not the only factor that determines your ad income. The formula for ad income on your website is RPM* x Traffic = Income. That means you have not one but two levers you can pull to increase your traffic. Only focusing on one (traffic) means leaving money on the table. *To further confuse the issue, it’s important to note that this isn’t strictly accurate. RPM is actually an after-the-fact calculation of the amount of revenue you earned per 1,000 sessions on your site. But we’re speaking very broadly here, and trying to understand why it is important to focus on RPM in additional to traffic, so for the sake of simplicity, you can think of your average income as average RPM x traffic. Or just trust me when I say that RPM is important. I already talked about how I worked on increasing my traffic by optimizing both new and existing post for search performance, and by hiring an expert to make sure I was driving as much Pinterest traffic to my site as possible. Increasing my RPM was a bit trickier. I relied really heavily on the free resources provided by my ad network, Mediavine. Their blog is a treasure trove of lessons for understanding RPM and making changes to your site to optimize for it. It’s all free, by the way. Lengthened posts. The longer the post, the more real estate it takes up, and the more room for ads. Broke up large paragraphs. Assuming ads appear between paragraphs, you could write three long paragraphs, which only allows for two ads to display, or 6-8 short paragraphs, which allows for 5-7 ads to display. Added an ad in my recipe card. This is a lucrative advertising spot, and I wasn’t earning any money on it. Shortened my sidebar. Another very lucrative ad is the one that loads at the end of your sidebar, so the longer the user has to scroll to get to the end of it, the less time that valuable ad will be on their screen. Monetized the few videos I do have. Remember how I tried and failed at video? At least I do have a few left over from that period, which I made sure to upload in such a way that a short commercial will play before they load. Stopped trying to micromanage and just let Mediavine apply optimum ad density settings on my site. Yes, it meant a few more ads, but I didn’t lose any traffic and I made a lot more money. Mediavine really has this down to a science; all I had to do was get out of their way. I immediately started to see my RPM rising and it stayed steadily in the $18-$20+ range almost every day since (except for the beginning of the year when everyone briefly stops spending money). For context, that’s a 60-80% increase over my RPMs in 2017, which was already a substantial increase over my previous ad network earnings. This allowed me to stop having to worry about scrounging for sponsored work, which meant I could focus on the longer term strategy of creating great, shareable, evergreen content because my income was coming from my page views. Any of these changes on their own would have been an improvement. But together they transformed my business. In 2017, I had just over one million sessions (times people came to my site). In 2018, I had 1.55 million sessions. That was a 53% increase in total traffic, and a 104% increase in organic (search) traffic. I also saw a 45% increase in social traffic, and 40% increase in email traffic in 2018 vs. 2017. January is my best traffic month every year, and it’s extremely important because it’s when I get a ton of new followers for the year and it always sets the tone for the year to come. In January 2019, my overall traffic was up 70% and my organic traffic was up 185% over January 2018. December is always the most important month for ad income because that’s when the RPMs are the best – meaning it is the best opportunity all year to make money. My ad income more than doubled in December 2018 vs December 2017, due to my efforts to increase my RPM combined with my traffic jump. That’s not to say everything magically grew. My Facebook and Twitter barely grew at all. My instagram is a slow and steady kind of thing. But I saw down at the beginning of the year and thought about what was important to me, both personally and business-wise, for my site and very intentionally invested my time and energy into those things. Could I have even more traffic if I worked full time on my blog? Absolutely. But it’s a chicken and egg: if I didn’t have a day job I could double down on this strategy and grow faster, but if I didn’t have a day job I would probably not have taken a step back, devised this strategy, and would still be struggling to find focus and find my way. But overall, is it working? Heck yes. I’m very proud of the results I’ve seen this year from intentional, strategic work. But I’m not going to slow down yet. The most important part of any strategy is to keep learning, keep adjusting, and keep hustling. Let’s see what happens in 2019! Coming soon, I’ll be sharing more information about some of the specifics you’ve asked me about including keyword research, how to optimize and article, and how to develop a blogging strategy. Is there anything else you’d like me to cover? Leave me a comment below, or send me an email (nora@acleanbake.com). I’ve been swimming in these very waters for a while now and am determined to follow your system. My biggest issue is figuring out my blogs value and my audience. Nora, this post is amazing. A couple of questions, do you exclusively use SEM Rush and Ahrefs or have you tried other free software like Ubbersuggest? Do you pay for both SEM Rush and Ahrefs? Is there one you prefer over the other? I would love to know more about your exact process about how you find keywords and determine what recipes you will develop or what blog topics you will cover based on the factors you mentioned. I need to start doing that because what I am doing is just throwing spaghetti at the wall with my content. Also, where did you find a Pinterest expert? I love Pinterest and being a new blogger 90% of my traffic comes from Pinterest but Pinterest and Tailwind take too much precious time for me that I feel I can be spending on creating content. I tried posting for a VA request on some mom blogger FB groups but it didn’t seem like anyone really knows Pinterest and Tailwind in those groups. Thanks for all of your help!!! I exclusively use Ahrefs right now (although I’ve exclusively used SEM Rush in the past). In my experience those are the most powerful and insightful. I use a paid Ahrefs subscription but I used a free SEM Rush subscription before and, although there were a few features I didn’t have access to, it was enough to get started with. I will be doing a separate post about keyword research and editorial planning – stay tuned! I found my Pinterest expert by asking around in Facebook groups and going with a referral from another blogger. I actually got about 4 referrals, interviewed them all, and selected one. She’s been amazing! Try asking other blogging friends, and also joining some Facebook VA groups. There is one in particular, called Food Blogger Virtual Assistants, that might be helpful in connecting you with some VAs! Wow, this is awesome, Though I can’t fathom what RPM is lol…I can’t wait for your post on keywords. I found this post after hearing you on the Food Blogger Pro podcast. Great to see your story and advice in writing – so many of us can relate to finally prioritizing your time and effort for traffic, especially when working another job. Thank you so much for sharing all this precious knowledge! I’m so glad you found me and that this is helpful! Good information, thanks for sharing!